A sleeping bag fills the bag, so there is little extra room for a rucksack. 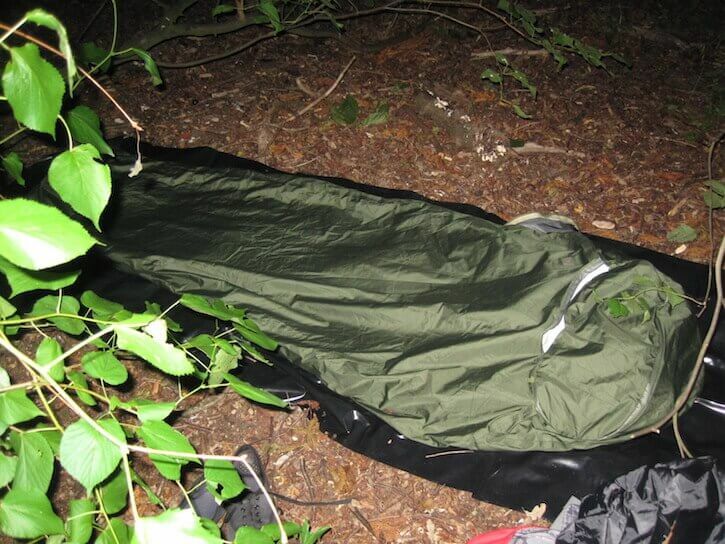 The Highlander Hawk bivy bag being used on a wild camp. A mesh covering can replace the standard material panel at the head end. 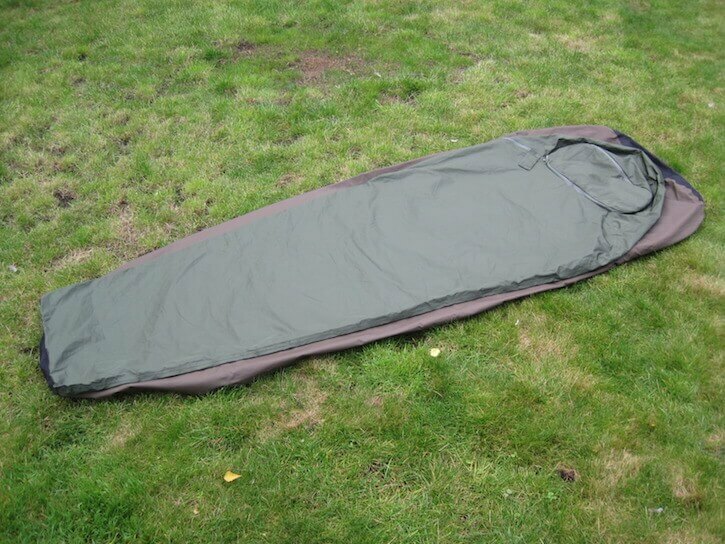 Some other bivy bags, such as the Wild Country Scout also shown in this image, offer a bit more room. There are multiple zips, which can prove a big fiddly when inside the bag at night. The arrangement at the head end sets the Highlander Hawk apart from other bivy bags. The Highlander Hawk is a reasonably priced mid-range bivy bag. When it comes to immersing yourself in nature, perhaps the best way to do it is to sleep than under the stars in a bivy bag. These waterproof sleeping bag covers are a lightweight alternative to a tent, and they offer the chance to enjoy a view of the night sky in a way that tents typically cannot. 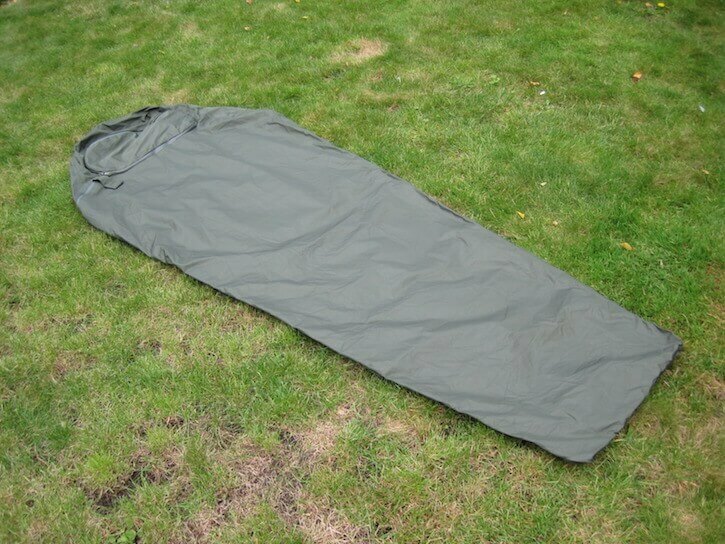 And, as well as keeping your sleeping bag dry (setting up a tarpaulin above you is recommended when heavier rain is expected), they should add a few degrees of warmth, which is especially welcome during colder weather. 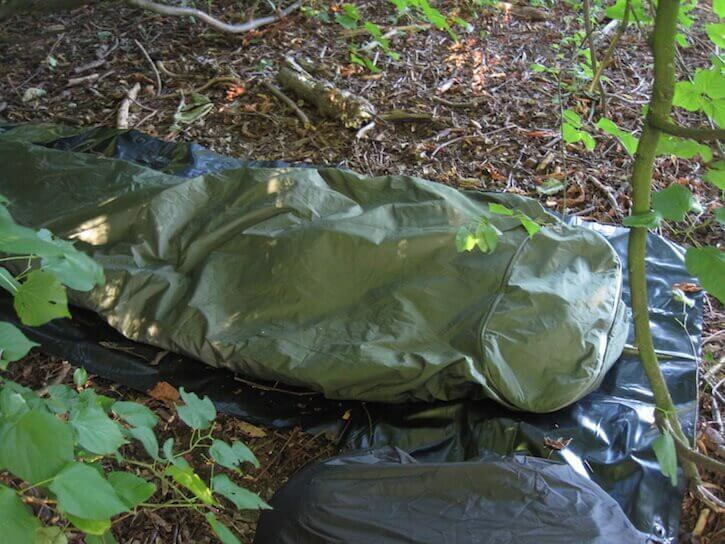 The name bivy, also often written as bivvy or bivi, comes from the French word bivouac, which itself can be traced back to an old German term for keeping watch, typically in a military context. 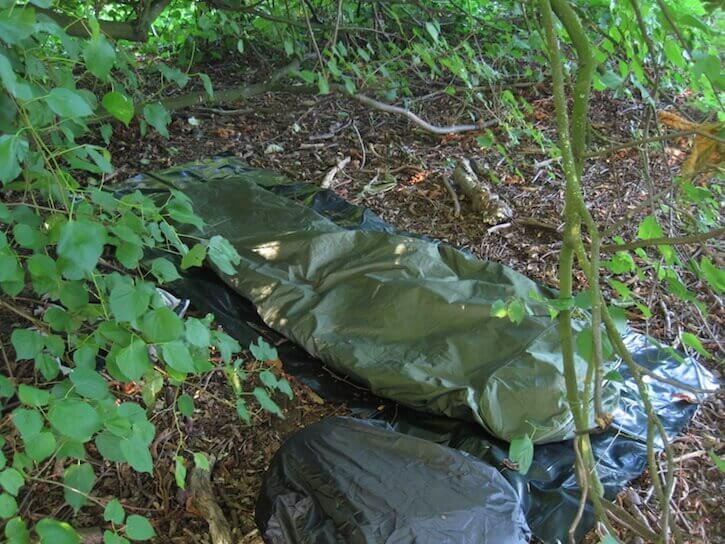 In modern times, bivy bags have been made for mountaineers who need to craft a makeshift camp when attempting an ascent, but they have also become popular with wild campers. 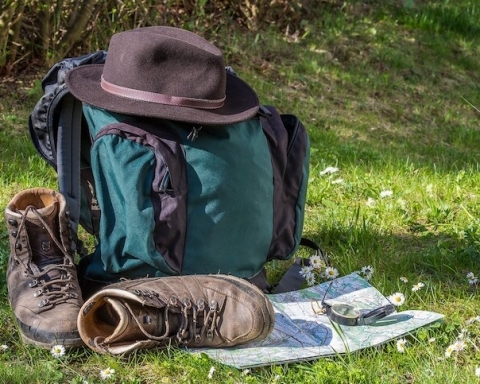 Indeed in recent years, despite tents having become ever lighter, they seem to have undergone a resurgence in popularity, thanks in part to the trend for “micro-adventures”, overnight trips out into the wild that is fitted around the routines of working life. 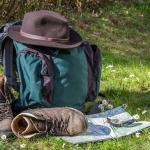 Secondhand ex-army bivy bags are popular with adventurers, but some alternatives are on the market and available to buy new, among them the Hawk bivy bag made by Highlander of Scotland. This is a fairly rugged mid-range bag that manages to be both waterproof and, on the several occasions that this reviewer has used it, breathable. 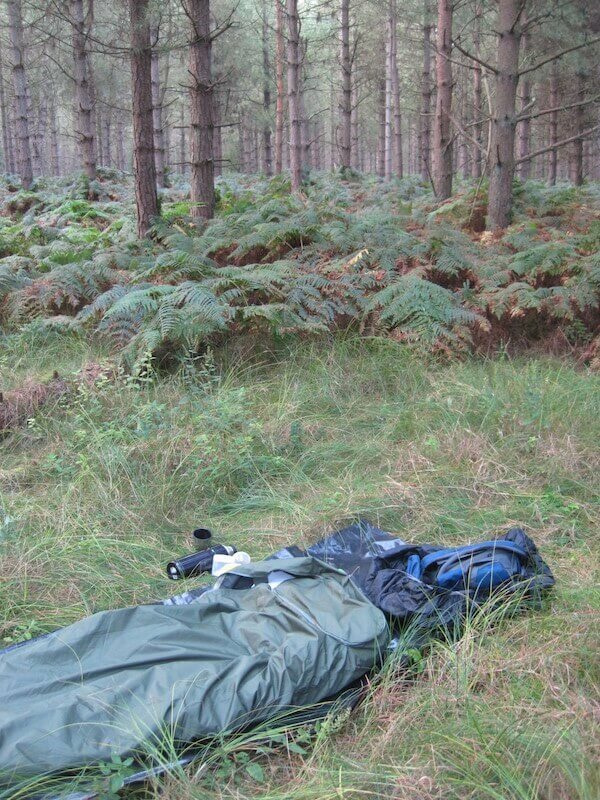 In relatively mild weather, there has not been a hint of dampness on the sleeping bag in the morning. This is something that many cheaper bivy bags fall down on, leaving your sleeping bag dripping with moisture after a night outdoors even when there has been no rain. At 220cm long and 80cm wide at the shoulders (at least in its current form — specifications seem to have changed over the years), the Hawk is smaller than an ex-army bag and, as a result, it would be difficult to fit a large rucksack inside the bag with you. 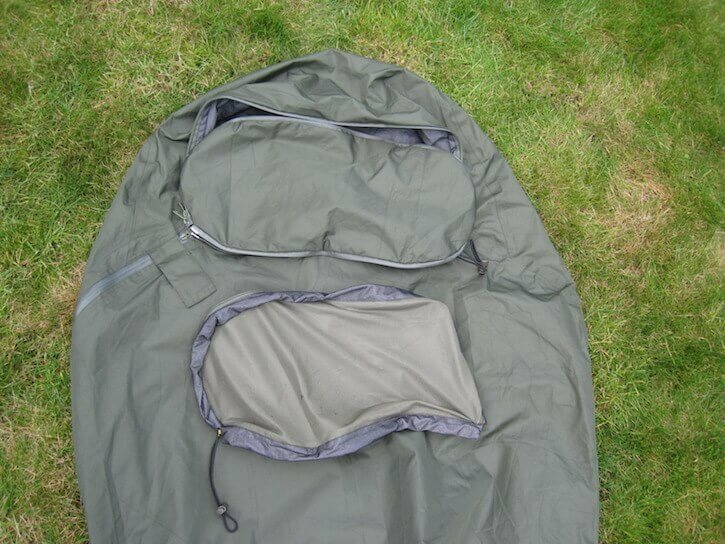 With an ex-army bivy bag, or any other bivy bags like the Wild Country Scout or the Rab Assault (both excellent bags but sadly discontinued), there is enough room to fit a backpack at the head end, at least if you tend not to sleep completely stretched out. 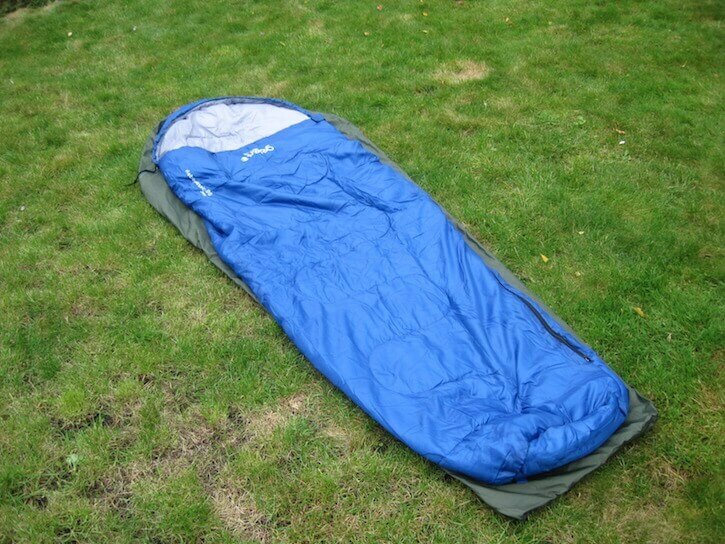 With the Highlander Hawk, this isn’t possible as a sleeping bag because it takes up almost all the space. 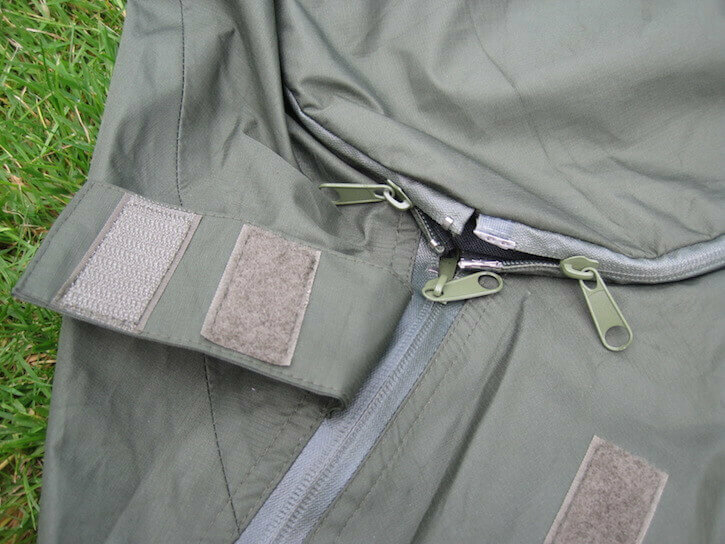 Taped seams help to ensure that the Highlander Hawk bivy bag is waterproof. 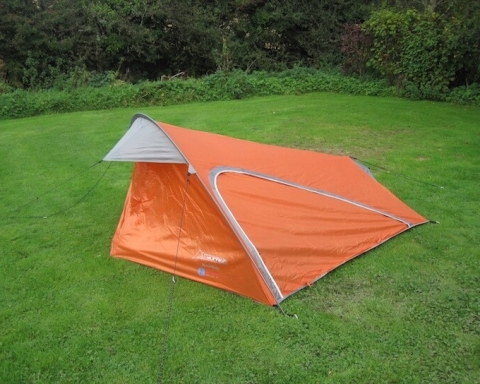 This slight downside regarding room is partly balanced out by a weight saving, with the Hawk hitting the scales at 680g, which is several hundred grams lighter than an average ex-army bivy bag. What also marks the Highlander Hawk out from the myriad other bivy bags available are the removable areas of material in the head area. The bag can be fully zipped up with either a wire-supported mesh area covering the face — ideal for keeping out midges and other troublesome insects — or a piece of standard material. The zips attached to these various features can, however, prove a bit fiddly when inside the bag at night. Zip also extends down the right-hand side of the bag for ease of entry, a major plus point when compared to the many bivy bags that can only be entered in the head area. 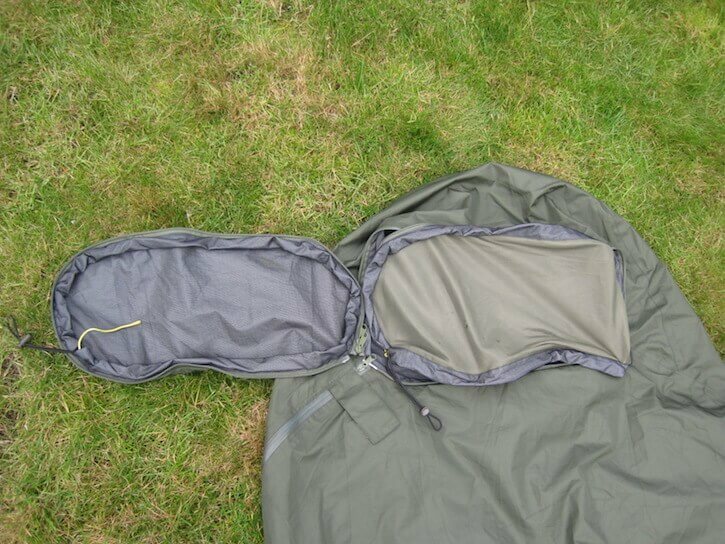 It’s best to ensure you have a sleeping bag that also has its zip on the right. 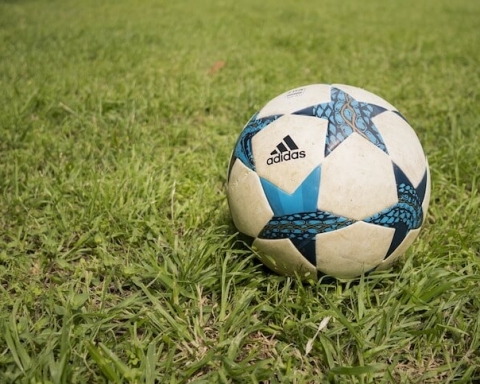 The seams are taped, and the bag as a whole has a sturdy feel to it, being made of Highlander’s reasonably thick Ab-tex Trimax polyester material, so as well as adding extra warmth, it is likely to prove durable. The green colour of the bag in its current form is both attractive and, more importantly, inconspicuous, making it perfect for wild camping. Usually retailing for around $70, the Highlander Hawk is reasonable value and is well worth considering. 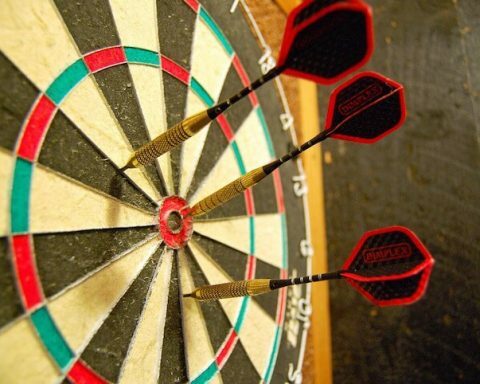 There are many alternatives on the market at a range of prices. 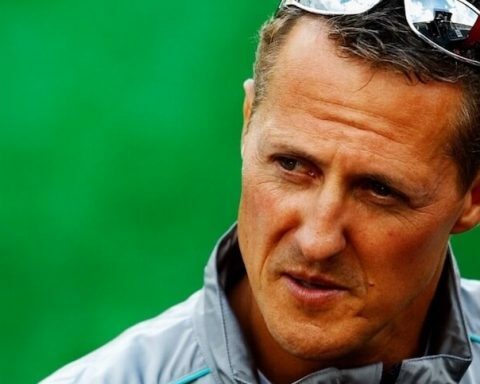 Perhaps, secondhand examples usually sell for about two-thirds the price of a brand new Hawk. The Hawk costs about twice as much as another Highlander bivy bag, the Kestrel, which is lighter but, as other users have noted, less breathable. 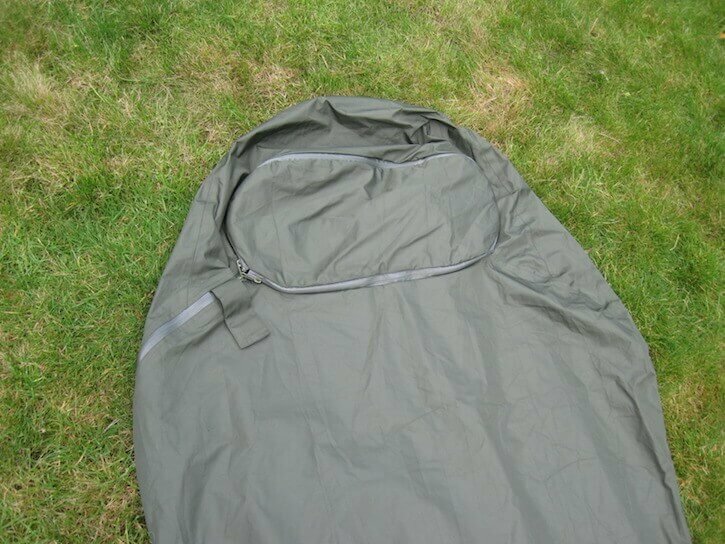 Very similar to the Hawk, but incorporating a self-inflating sleeping mat, is Highlander’s Dragon’s Egg bivy bag. At the head end, this has an open space with a drawcord where the Hawk has its mesh or material patches. 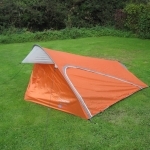 Highlander used to make a more expensive hooped bivy called the Falcon, which shared the Hawk’s excellent breathability. 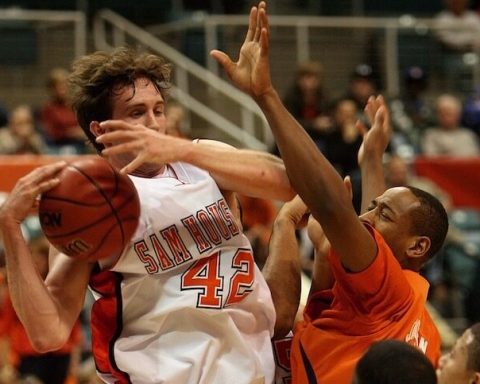 Unfortunately, the Hawk is no longer made, although occasionally secondhand examples turn up on sites like eBay. A bag in a similar price range to the Hawk is the popular Alpkit Hunka, which weighs about half as much but only has a simpler drawcord arrangement in the head area. Karrimor’s excellent X lite bivy bag is also worth looking at, being much lighter and cheaper than the Hawk, but still breathable. 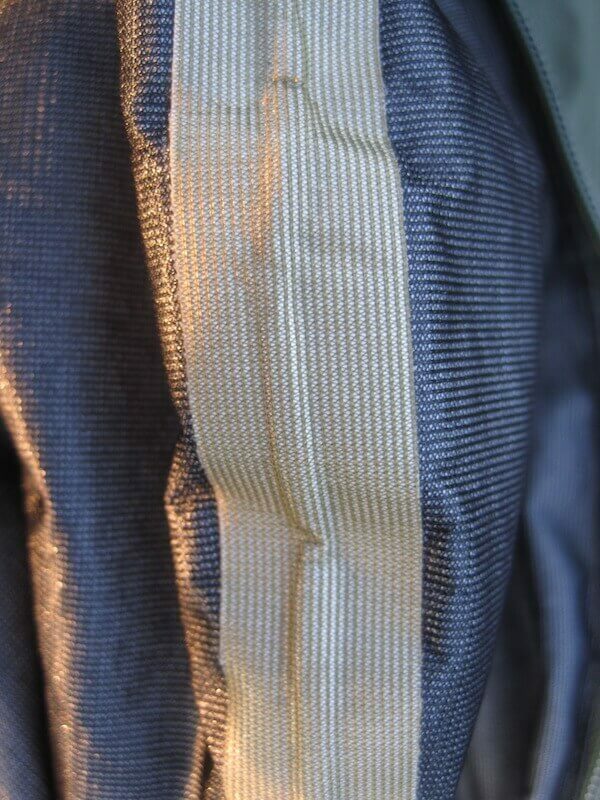 Like the Alpkit Hunka, it has a drawcord arrangement at the head area. For those on multi-day treks where every gram counts, this downside will probably be outweighed by the bag’s lightness. Previous Story Previous post: Where Mozart drank in Prague?